Ukrainian boxer Oleksandr Gvozdyk in his 16th fight (13 KO) has beaten Canadian Adonis Stevenson in the professional ring and won the WBC light heavyweight world champion title (up to 79.378 kg). The Ukrainian won the fight in the Centre Videotron in Quebec (Canada) by right-ahead blow after a series of punches in the 11th round. 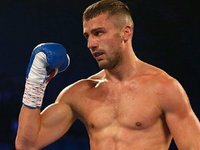 Thus, Gvozdyk became the fourth Ukrainian, the current world boxing champion on a par with Vasyl Lomachenko, Oleksandr Usyk and Artem Dalakyan. As reported, Gvozdyk is the bronze medalist of the 2012 Olympic Games and the 2013 Universiade champion.